Just 6% of adults with a learning disability were in paid employment in 2018, according to figures from NHS Digital. It’s a figure that has remained stubbornly low, despite numerous attempts to address the issue, such as the government’s Work and Health Programme, although the 2018 figure was up 0.3% on the previous year. But there are projects on a local level that are having a positive effect, such as Enable in Wolverhampton in the West Midlands. Enable, commissioned by Wolverhampton City Council Social Care Services, focuses on finding paid employment predominantly for people with learning disabilities and/or autism, and also ensuring that the job is sustained. However, getting people into Enable is the key, as some in social care, nursing and other health professions are still largely unaware of employment as an option for people with learning disabilities, according to Enable disability services manager Jonathan Allan. Indeed, once Enable had been set up, the main priority was to increase knowledge of it and what it offers to local social workers, health workers and social care professionals and build relationships with them. ‘We probably spent the first year doing that, and since then we have helped more and more people into employment each year in a range of industries, from Jaguar Land Rover, Midland Metro and the National Exhibition Centre to local small and large employers in Wolverhampton,’ says Mr Allan. Enable works with people individually to find out what sort of job they want and take them through all the possibilities. However, Enable’s job coaches are also realistic. For example, if a client is looking for a job in a sector with few openings, they will talk to them about widening their search. Enable talks to employers on an individual basis, as the business is matched with the employee. But once a person has secured a job, Enable helps them adapt to being an employee and their new role. ‘If they are moving from never having had a job before to working it is unrealistic for most people to go into full-time employment immediately, or even half-time,’ he says. When a person with a learning disability has found a job, Enable puts in a job coach alongside them. ‘They work alongside the new employee and help make sure they understand the skills and methods and get to know their colleagues and the general rules of work,’ Mr Allan says. ‘When any of us start a new job we are dealing with two different things. One is the technical side of the job – the main tasks and the skills we need to do the job – and the other is having a whole load of new relationships with a range of people. That’s why we put in a job coach to ease that process for a person with learning disabilities or autism. ‘The job coach also links to the person’s supervisor to make sure things are going well, or if there are any difficulties how they can be ironed out. We don’t want the employer to have the pressure of feeling they have to provide extra support, because we provide it. Enable has had national success, winning the Breaking Down Barriers Award at the National Learning Disabilities and Autism Awards last year. For Mr Allan, Enable’s success is in part due to its focus on paid employment. ‘In the past many organisations working in learning disability employment have not had good results, and that’s because they have helped people into work experience, education and paid employment. ‘If you do all three then often the tendency is to focus on the work experience and education opportunities, because they are so much easier to do. Paid employment is a difficult area to work in and develop, but it is much more beneficial for the service user. John and Steven are two men with learning disabilities at opposite ends of the age spectrum – John is 24, Steven 57 – but they were united by the same desire: to find paid employment. Both men were referred to Enable to try to find a job, and they are now cleaners at the main works compound of the Midlands Metro Alliance. 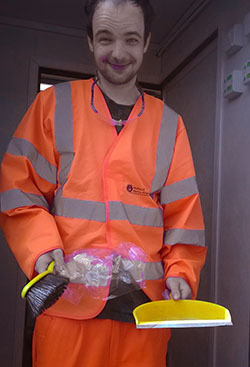 They work two hours per day, Monday to Friday, and their responsibilities include collecting rubbish from office areas, tidying kitchens and cleaning and mopping toilets, the canteen and changing areas. Both are happy to be in work. While Steven doesn’t receive any support from Wolverhampton Social Services, he is supported by his sister for things such as paying bills, as he cannot read or write. At Enable, he was assigned a job coach who offered support and guidance with things like time management, travel training and organising his workload. 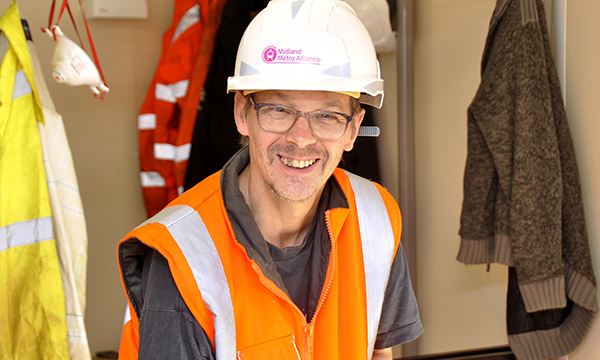 Meanwhile John, who lives in supported accommodation, had a job coach who supported him with learning new routines and health and safety awareness. Their job coach, Chris, attended shifts with Steven and John to help them settle into their new roles and acted as a link with their employer to solve any issues that arose. Since starting their roles, Steven and John have proved to be methodical workers who are well-liked members of the team. John has also gained confidence and his overall well-being has improved. He has gained a sense of responsibility and has more structure to his day. He is saving up his wages to pay for a fishing holiday.